In September 2015 the Centers For Disease Control and Prevention (CDC) released a report titled “Infection control policies and procedures” outlining protocols to ensure water at dental clinics is free from harmful bacteria and safe for its patients. The report advised dentists and associated staff to consult dental unit manufacturers for appropriate methods and equipment to maintain the recommended quality of dental water. Though useful to increase awareness about the necessity to test and appropriately treat dental water, no compliance standards were enforced. Alarmingly, three years after the report’s release, most dental clinics still do not test their water. This is of serious concern. Dr. Nuala Porteous, a researcher and dental water expert at University of Texas Health Science Center Dental School in San Antonio, confirms dental unit waterlines are notorious for growing bacteria. There have been two national outbreaks of Mycobacterium abscessus in dental clinics, underscoring the importance of testing water in dental units. Most recently, In 2016, one year after the CDC's guidelines were published, there were 72 confirmed cases of apparent Mycobacterium abscessus infections in children who had pulpotomy procedures at a pediatric dental facility in Anaheim. This outbreak prompted the development of AB1277, legislation to enforce California’s safe water standards in dental clinics. Assembly Bill No. 1277 was filed in California in October of 2017 and will be implemented by December 31, 2018. The bill will require the Dental Board of California (DBC) to revise the minimum standards for infection control “to require water or other methods used for irrigation to be sterile or contain recognized disinfecting or antibacterial properties when performing dental procedures that expose dental pulp”. Currently, California is the only state to adopt legislation requiring testing of dental water units, but this move will likely lead the way to other states creating similar legislation. The bill is intended to reduce the probability of other bacterial outbreaks by strengthening regulatory protections surrounding water safety. As the body responsible for licensing and regulating California’s 11,000 dental practices, the DBC will be required to develop and enforce final regulations on the issue as of December 31, 2018. Dental clinics will quite certainly be required to treat their water with antibacterial line treatments and will likely be required to regularly test water as well. Leaders in the field are currently developing policies to ensure proper implementation of AB 1277. It’s possible that regular testing of water quality and reporting to an external body will be required, or the DBC will commission inspectors to conduct site visits. ProEdge Dental Water Labs has developed a simple and efficient system for supporting dental clinics through the process of testing and treating their water, and then implementing an actionable plan to ensure safe water is maintained. From start to finish, we assist each dentist, hygienist, office manager, or infection control coordinator to treat their dental water quickly, effectively, and repeatedly so you can focus on what you do best - patient dental care. 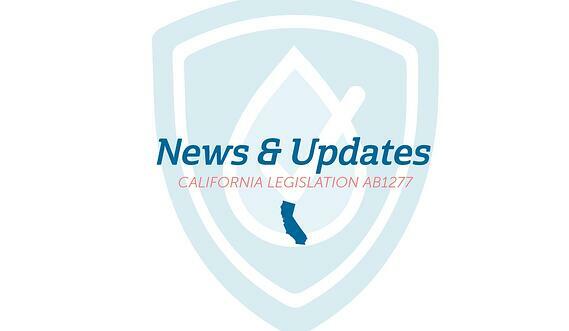 With uncertainty about the practical implementation of AB 1277 in California, ProEdge will be monitoring the latest legislation and ready to support dental professionals to ensure they’re in compliance, making it easy for dental clinics to achieve water that meets and exceeds the CDC/ADA standards. While not all dentists are required to test their water, at least for the moment, ProEdge is here to offer the security and assurance of knowing water safety is checked of your list! In the midst of changing legislation, ProEdge offers dentist’s the assurance of knowing water quality will always exceed safety standards! Porteous N., Sun,Y., Dang S., Schoolfield, J. (2017) Two-year evaluation of the antimicrobial properties of N-halamine DUWL tubing. Journal of Dental Research, 96A: 1451.